This time we have chosen the power food Nectarine to feature in our post. One so delicious in flavour and smell! I don’t know about you but when summer comes these are one of the first fruits I grab! So juicy and sweet.. an absolute MUST HAVE!! A lot of times Nectarines are thought of as peaches without a beard. They are from the same family! Nectarines are supposed to be much sweeter though. The most beneficial aspect of this fruit is that it contains antioxidants. When eaten, your body converts the antioxidants into Vitamin A which is one vitamin your body can’t get enough of! One single nectarine contains 20% of the recommended daily intake of Vitamin A. You NEED Vitamin A and if you aren’t getting enough it can be detrimental to your health and can affect bone development, reproductive disorders and in serious circumstances can cause death. You should also know that Vitamin A is critical to your eyesight. Nectarines are also a great source of Vitamin C.
If you’re like us and enjoy majority of fruits with the skin left on you’ll appreciate the fact that the peel of a nectarine is VERY rich in bioflavonoids (antioxidants found in plant pigment that fight off cancer and other diseases by fighting against the damage that has already occurred) and is also rich in carotenoids. 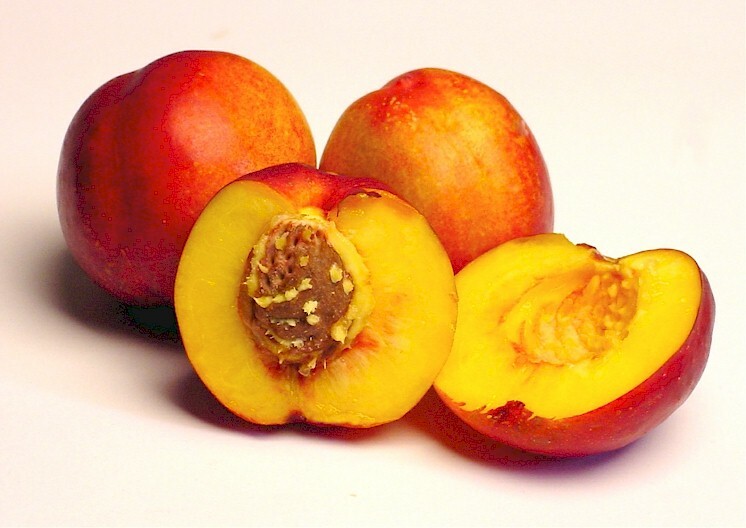 Nectarines get their name from the Greek god Nekter. Did you know that Necter was the drink of the greek gods? Need to poop? Eat a nectarine! When you take the skin off the nectarine will darken. This will not affect the taste or nutritional value. Fruits and Veggies that are bright red, orange and yellow in colour are likely to contain Beta-Carotone -- which allows your body to produce Vitamin A.
Nectarines are delicious served on their own, but here are some other great ways to eat them. Yum! Hope you pick some up soon!